Every now and then we will be giving you a chance to get to know our local, Downtown business owners – your friends and neighbors – who make Downtown such a special place. We’d like to introduce you to John Cooley, owner of Cooley Designs, located in A Robins Nest at 602 Main Street. John Cooley was born on March 7th, 1960 in Buffalo, New York and raised in the suburbs by his mother and grandmother. The self-described “rambunctious kid”, spent his early childhood immersed in a culture of arts, sports, and hard dirty work. As soon as he could, John picked up his first job as a local paperboy. Being young, ambitious, and eager to earn a buck, he later started mowing the lawns of his paper route customers for extra income. Needless to say, he had a natural drive for business. With having an uncle that preformed on Broadway and a mother who was an accomplished pianist, John was exposed to the arts a very early age. It’s this culture that led to his natural gravitation toward the arts. As paradoxical as it may seem, despite having such a natural propensity for all-things-art, he had an equally intense passion for sports. In 1978, John graduated from Williamsville High School where he was the sitting president for the Art Society. Following graduation, he went on to play football for Cortland State University of New York where he found himself as their sitting president of Cortland’s Art Society as well. During his tenure, he suffered a shoulder injury playing football that sadly cut his athletic career short. With only being able to pursue one of his two greatest passions, he transferred to New Paltz State University of New York which has one of the most highly esteemed metalsmithing programs. After spending the remainder of his college career there, John graduated with a bachelor’s in fine arts with a concentration in gold and silversmithing. At the young age of 23, a full life ahead and nothing to lose, John picked up his life and moved to Denver, Colorado where he immersed himself in the rich art culture in Downtown Denver. After living through his formative years in fast-paced New York, he was ready for a much-needed change in culture and scenery. “No joke, the New York minute is only thirty seconds!”, he says. In 1988, he opened his first shop on the 16th Street Mall. While there, John found love, married, became a father, as well as hung various pieces in the art district. He considers himself to be an artist, not just a jeweler, and it’s apparent in his extensive collection of personal works of art of all different mediums. At 34, John was faced with the tragedy of losing his wife and being left to raise his 3-year-old son on his own. It wasn’t long after that he made the trek to Grand Junction, Colorado in pursuit of a better place to raise his son. On the topic of his newly found home he says, “It’s beautiful! It’s paradise! You gotta love it!”. After making the big move, he opened an art gallery in addition to his jewelry shop, Cooley Designs, at 530 Main St. While there, he hosted many local works of art, as well as his own. Every 30 days, he would have a new showing to promote the arts locally, and by the end of his run in 2011 he touted, at the least, 27 independent shows. Shortly after 2011, John made the decision to hang up the saddle for 5 years to regroup. In 2016, Robin and Shane, owners of Robin’s Nest located at 602 Main St., offered John a spot in their new space to continue his life’s work and passion. Without too much thought or hesitation, he picked up where he left off, bringing his original business name and many of his past local clients with him. Since, John has continued to serve the Grand Valley area as an artist, a teacher, and a businessman. Many of his works of art, and others, hang and rest on the walls and pedestals around his shop. Not only is he an active advocate for local artist, he is still an active artist himself. 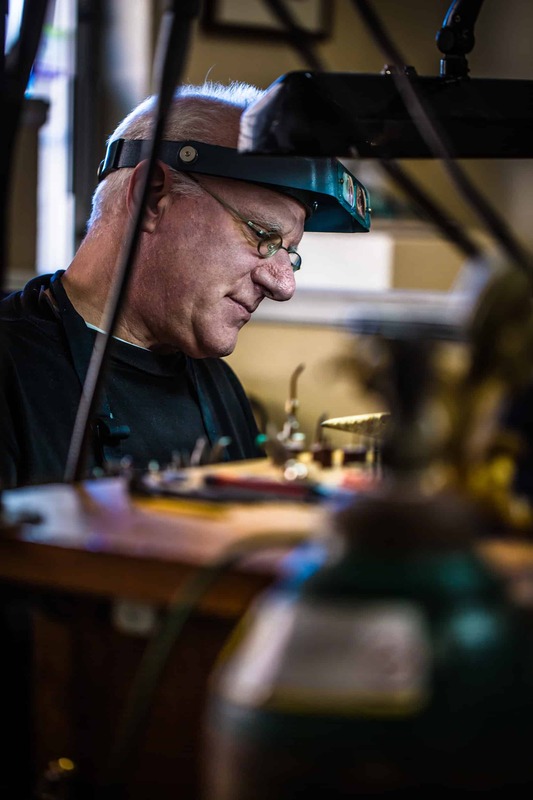 When he’s not repairing, creating and teaching about jewelry, John is actively creating art of his own. Despite having a background as a jeweler, he produces art that exemplifies his abilities in all mediums. From watercolors to large sculptures, there isn’t much he isn’t willing to do to create his next master piece.